Bestway Steel Frame Solar Pool Covers help to insulate your metal frame pool, warm the water and keep it free from dirt, leaves, bugs, beetle and insects! There’s no need to tie the solar pool cover down like conventional covers because it simply floats on the water’s surface. Durable material, which isn’t too dissimilar to bubble wrap, has been used to design the swimming pool solar covers. The air bubbles have the ability to absorb heat from the sun and warm the water whilst their insulating ability ensures that it stays locked inside the pool. By using a pool solar cover you can also save money on water and chemicals because it reduces evaporation. 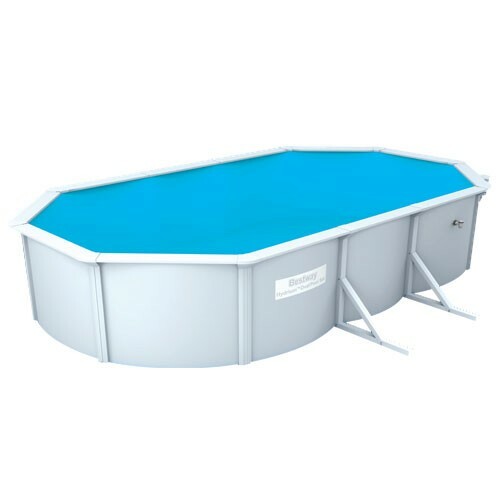 It also prevents debris from dropping into the water and accumulating inside a pool. Whatever the size or style of your Bestway Above Ground Swimming Pool you’ll find solar pool covers to match in the Bestway Pool Accessories collection. The range also contains filter pumps, replacement cartridges, pool heaters and a host of other products designed to enhance your Bestway Above Ground Pool.